Anxiety: Whether you have temporary anxiety or an anxiety disorder, it can seriously disrupt sleep. “Sometimes, simply worrying about whether you will fall asleep can make it difficult to sleep,” says W. Keith Graham, MD, D-ABSM, pulmonologist and sleep medicine specialist at Saint Francis Medical Center. Hormonal shifts: Women are particularly at risk for insomnia because of the hormonal shifts they experience during their menstrual cycle and menopause. Depression: Insomnia is a common symptom of depression. “In particular, people with depression may awaken early in the morning,” says Graham. Stress: Stressful situations at work, family turmoil, the death of a loved one or the loss of a job can keep your mind active at night. Medications: Some medications may make it difficult to fall asleep. In particular, medications for depression, allergies, heart, blood pressure and attention deficit disorder (ADD) can cause insomnia. 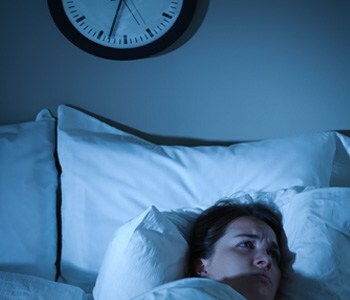 Medical conditions: People with conditions such as arthritis, heart failure, cancer, lung disease, overactive thyroid and Alzheimer’s disease are at risk for battling insomnia. Aging: Sometimes, the simple process of aging can be enough to cause problems with sleep. As you become older, your internal clock shifts, causing you to fall asleep earlier in the evening and wake earlier in the morning.